Stop struggling. Start connecting … to YOU! There’s an abundance of wisdom inside you just waiting to be discovered and put to practical use in your life and business. Imagine making decisions from a place of insight rather than confusion and fear. Imagine reaching your goals faster, easier, and with greater success than ever before. 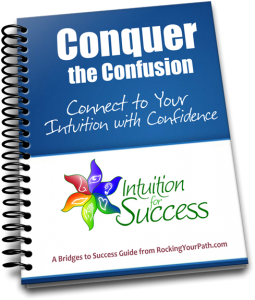 This ecourse, delivered right to your inbox every few days, includes five detailed lessons that explain how to tap into your intuitive energy with confidence. From the exercises and worksheets, you’ll learn how to recognize important signs and symbols, and the basics on how to interpret them in meaningful ways. Plus, there’s a special bonus lesson that contains what I consider the secret key to unlocking your advanced intuitive skills. Sign up today for your FREE mini ecourse. Lesson Six: BONUS Lesson. Learn the secret key to unlocking your advanced intuitive skills. This isn’t fortune-telling. This is taking charge of your senses … all of them … and putting them to work for you. So, What Does Kat Know About Intuition? Click here to find out. Or curious about her company name, 56 Vibes Services? Find out what’s behind the name here.